Have you ever celebrated Tax Day? Take a deep breath. Tax Day 2019 is upon us. Instead of dwelling on what you might owe, or counting down the days till you get your refund, take a break and have some fun. There is so much to look forward to on Tax Day 2019 in Portland. Tuesday, April 15, 2019, is full of great deals, freebies and fun activities to get your mind off of Tax Day 2019. This deal is good for the entire month of April. Applebee’s is serving $1 strawberry margaritas all month long. 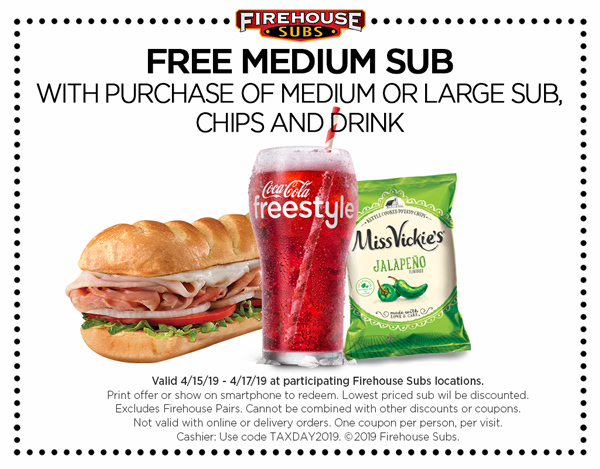 Use this coupon to get a free medium sub at Firehouse Subs with the purchase of a medium or large sub, chips, and a drink, from April 15 to 17. Starting April 15, BJ’s Restaurant and Brewery is offering half off large deep dish or tavern-cut pizzas available for dine in, take out or delivery, and free delivery and no service fee on delivery orders via bjsrestaurants.com. Offer ends May 5. Right in time for Tax Day, get half price on beer, wine and cocktails at Rally Pizza from 11 a.m. to 9 p.m. Your taxes are officially filed. It’s time to relax. From April 14 to 21 you can indulge in a free HydroMassage at any Planet Fitness location. Find your nearest Planet Fitness and get the coupon here. Take your documents to Office Depot or Office Max for free paper shredding. The promotion is offered now through April 27, 2019. You can bring in up to five pounds of documents to shred for free. Bring in the coupon, which is available to print online, or show it one your phone. Green Zebra’s three locations are serving free Yerba Mate from 7 a.m. to 7 p.m. Fill up your cup and kick start your Monday! From 2 to 5 p.m. at Wichita Center for Family and Community you’ll get a free Kona Ice just for stopping by. This offer is also available on the west side from 3 to 5 p.m. at H&R Block. Noodles & Company is offering NoodlesRewards guests $4 off orders of $10 or more for Tax Day when you order online from April 10 to April 15,. Note: sign up for NoodlesRewards by April 9 in order to receive the offer. The Starday Tavern is offering a bowl of tomato basil soup and grilled cheese for $7.50 on Tax Day from 4 to 9 p.m.
Here’s another excuse to put the stress behind you and have some fun. You may even win a gift card at these trivia nights throughout the Portland metro. Many are family friendly and dog friendly. Let that stress go at cheap yoga session throughout the city. Find one closest to you. So many great $6 deals at these theaters on Mondays!